Baltimore is considered to be the largest city in Maryland. It is one 1.5 million people’s metropolitan area center. Situated on Chesapeake Bay, this city reflects cultures along with neighborhoods starting from metal as well as glass skyscrapers to the brick row house and popular Inner Harbor. It offers various cultural opportunities, sports, outdoor activity and many more. You can enjoy surfing at the beaches that are within the driving distance from Baltimore. You can also move to the mountains. So book a cheap flight, reserve hotel rooms and then travel to Baltimore to have a great vacation. Summers are very hot as well as humid in Baltimore. On the other hand, winters are cold, windy as well as wet. All throughout the year the weather stays partly cloudy in the city. The temperature ranges from 30 degree F- 89 degree F. It rarely goes below 18 degree F or may be above 97 degree F. The hot season will be lasting from the month of May-September. The average high temperature daily is more than 79 degree F. July 21st is known to be the hottest day in the year. It has an average high temperature of 89 degree F and low temperature of 74 degree F. Cold season in Baltimore will last from December-March. The average high temperature daily is below 52 degree F. 29th January is the coldest day in the year. 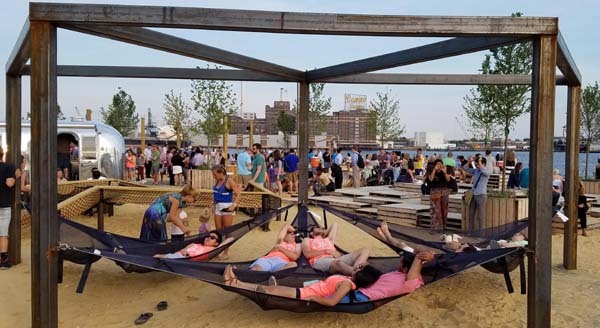 The average low temperature is of 30 degree F and high temperature of 43 degree F.
Peak season: June-August is the best time of visiting Baltimore. You need to book early flight tickets to avail cheap flight fare. Booking the hotels early is also needed as summer will bring huge crowds, hotel rates will be rising. City will be overflown with great events as well as festivals. Off-season: During September-November, the weather will be becoming chilly. The hotel rates also start to decrease during this time. Winter months from December-February will be getting very chilly. It is the least costly time of the year to visit the city. The famous spots are also free from crowds. If you visit Baltimore during the off season then never forget to carry winter garments and boots. This city is known for its breathtaking Inner Harbor and steamed crabs that are dusted with the spice of Old Bay. But now, Baltimore has a lot to offer to its visitors. Federal Hill Park: This park is a small walk from Inner Harbor and will offer you the waterfront’s panoramic view. Inner Harbor has been the primary stop for most of the tourists. But before visiting National Aquarium, the Science Center, Power Plant etc, enjoy the view of various attractions present around the waterfront at Federal Hill Park. You need to wear comfy shoes for climbing the steps to reach the top of having a bird’s eye view. Avenue in Hampden: It offers various independent shops, cafes as well as restaurants. It is a favorite spot to chill out. It is also popular for its yearly festivals. This street also includes the best restaurants as well as bars of the city. You can also visit Charmery to taste the Old Bay caramel ice-cream. Mount Vernon Place: It is located in the cultural center of Baltimore. It consists of Washington monument as well as parks that host outdoor events in the months of warm weather. You need to climb the marble steps to get a stunning look of the neighborhood of Mount Vernon. It consists of several architectural works such as the Norman Gothic church, Walters’s art museum and George Peabody library to name a few. Sandlot: If you wish to hang out with your friends beside the water, then this popular beach bar will be perfect. Never jump in the water. Rather grab a local beer with the local cuisines available at the restaurants present here. You should be here during the peak season as it remains closed at the time of off-season. Before you book the hotels in Baltimore, look out for cheap flight round trips. Try to make your travel and accommodation a bit cheap so that you can spend more on sightseeing, activities and food when you will be in Baltimore.